When Mary Victoria Leiter Curzon, wife of Lord Curzon, the viceroy of British India, urged her husband to take immediate measures to protect Kaziranga's rhinoceros, she had no idea that that it would be a major event in this region's history. 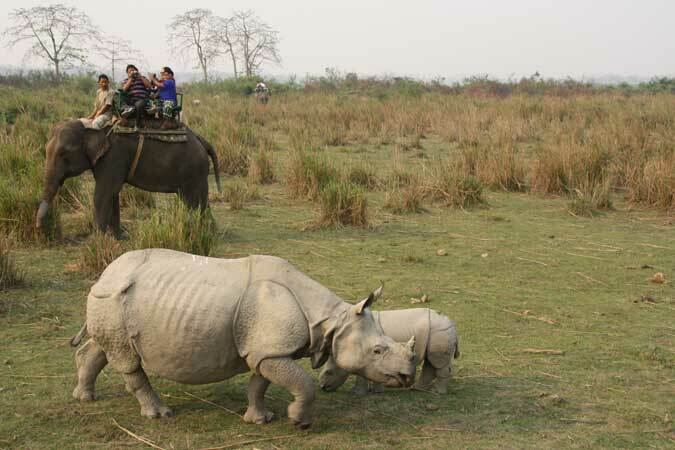 The Kaziranga National Park Assam offers for its tourists, has plenty of rhinos today. This is a great sight for tourists who visit this UNESCO World Heritage Site every year. Other than the great one-horned rhinoceroses, it also has tigers, leopards, jackals and many other wild animals. Park authorities have done a commendable job in maintaining it in an excellent condition and fostering growth of endangered species. 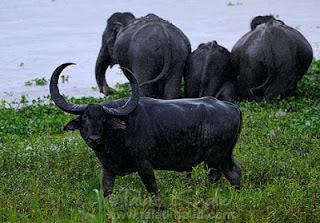 This wildlife sanctuary often features as an important tourist attraction on the itinerary of North-East India tours. Tourists have also supported various initiatives that authorities have taken over a period of time for the park's wildlife conservation. They also feel enchanted by charming beauty of this region’s natural surroundings and amazing landscapes. This wonderful habitat of rhinoceroses and other wild animals became famous after being declared as a World Heritage Site. This increased the number of tourists visiting this region, mostly for enjoying an amazing sight of one-horned rhinos and other animals wandering freely amidst natural surroundings. 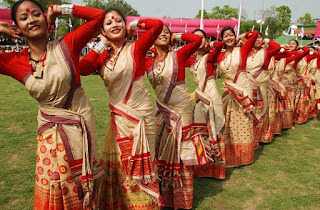 For domestic and international tourists travelling by air, airports located at Guwahati, Rowriah and Salonibari would be access points for reaching Kaziranga. They can either hire a private vehicle or use Assam State Transport Corporation's buses to reach the wildlife sanctuary. Best time to visit this region is between the months of November and April. Some of the hotels and resorts situated close to Kaziranga National Park provide luxurious accommodations for its guests. Rooms or cottages are fully equipped with modern facilities offer plenty of comforts and privacy for tourists. 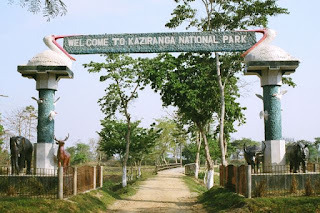 A stay in such hotels or resorts would enable tourists to enjoy their Kaziranga trip without any hassles. They can also enjoy additional facilities such as airport pick-up and drop facility, spa treatments and travel desk assistance. 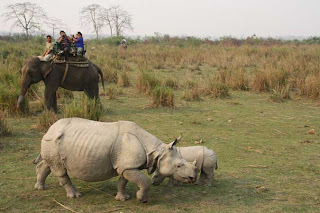 Some hotels in Kaziranga also arrange guided tours for watching rhinoceroses and other wild animals closely. 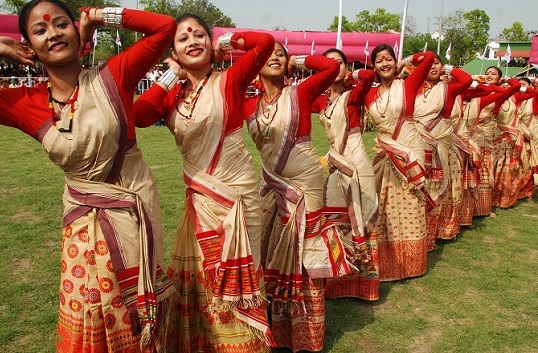 With eco-tourism gaining prominence in recent times, there are certain hotels at Kaziranga that are best suited for individuals involved this form of tourism. Visitors to this wildlife sanctuary can get huge discounts on accommodations if they get their bookings done well in advance. There are certain rules which need to be followed by all individuals visiting this National Park. Necessary permits have to be obtained before entering it and a safe distance has to be maintained while spotting wild animals. Playing of car stereo or transistors has to be avoided as the animals would get disturbed on hearing peculiar sounds. 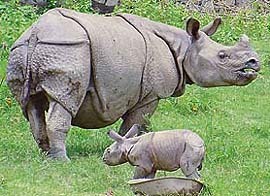 Following all instructions given by guides would ensure a smooth conduct of Kaziranga Rhino Tour and avoid any unpleasant situations. Guided tours offered by some hotels and resorts situated near the park are conducted by experienced professionals and being in their company would be beneficial in spotting all wild animals of this region.